I should have posted this a long time ago but I did not figure it looked good enough. Then I realized that I started blogging to give tips, advice, and inspiration to others and it was not about pretty photos or blog tours. I started blogging because I like to write, create, inspire, and garden. With this in mind, I will post my ugly scrap wood and upholstery fabric patio doggy door. It is not the prettiest door but it served its purpose for over a year! Yep maybe closer to a year and a half because my husband put it together late last spring or early summer when I was away. He knew how tired I was letting our 2 dogs and 3 cats in and out all day and even into the night. Until last week this door was in place allowing our Australian Shepherd, Jack/Fox terrier mix, and 3 housebroken cats to wandering in and out all day and night. The only problem came when the wind blew just right or the rain came down in buckets. Otherwise during the summer the flap stayed in place and did not really let out any more heat than my 28 year old windows. I could not find the pictures of the door in place so I had to improvise. 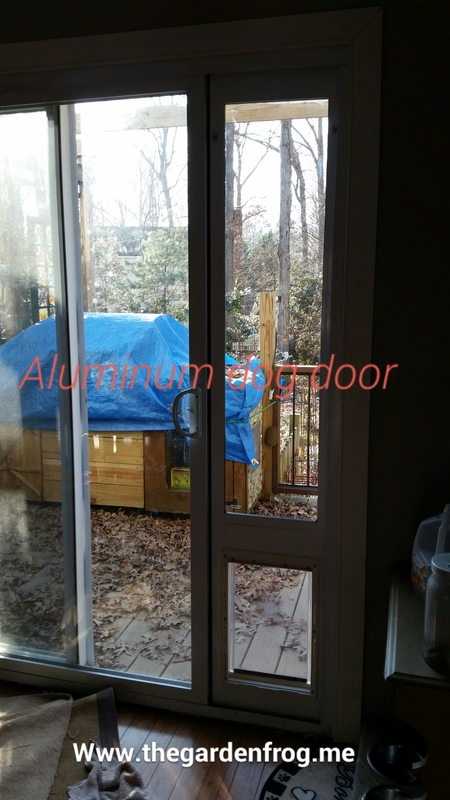 Now we broke down a few weeks ago and ordered the aluminum patio door online at Home Depot for around $150 which has worked out great. I will do another blog about the door and how we had to customize the door to fit our animals (the directions for some reason did not explain this). 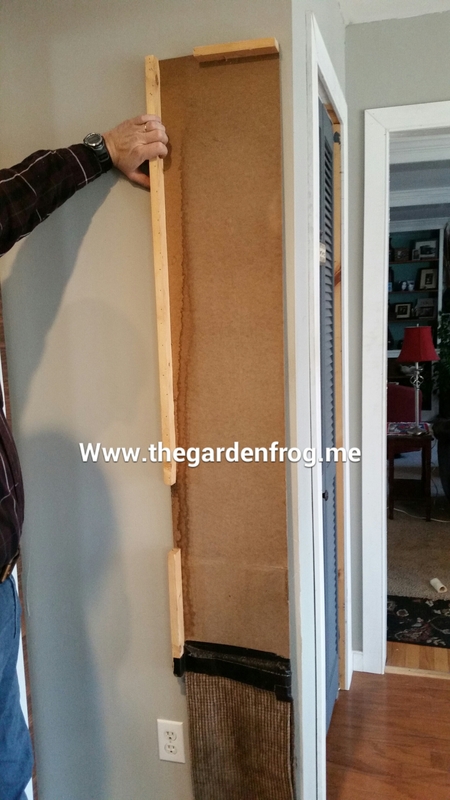 Anyhow, for now if you do not have the extra $150 then our DIY patio door may just be the answer. We also have a doggy/cat door in the garage (which is workshop) for the cats to go in and out in the dead of winter to use the kitty litter box. January and February are the coldest months and the cats stay in and sleep a lot in the cold and do not venture out much. If you live in the frigid areas of the country, winter may not be the best time to have it in unless you come up with a better flap idea. 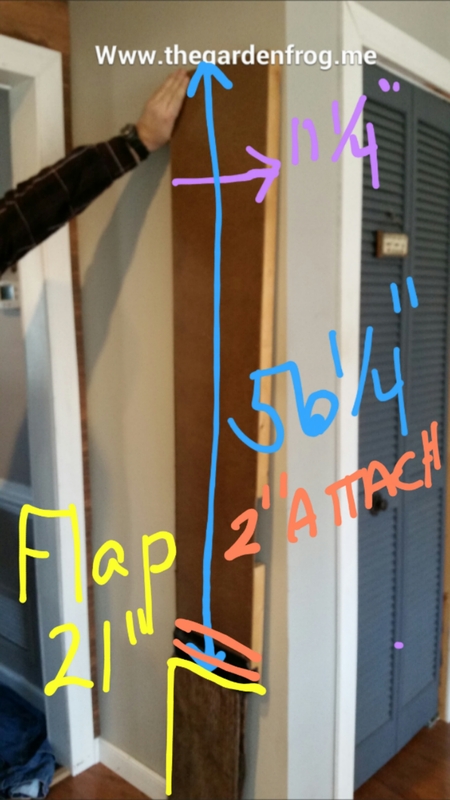 I wanted (but this was all the scrap we had from another project) to buy a plastic doggy door from Home Depot or EBay and put it in the piece of plywood that would go from the top to the bottom of the door. Like I said this is not the prettiest doggy door but it was functional. I hope this may even give you ideas on how to create your own doggy door if buying one is not an option. The wood trim pieces we had fit perfectly in the door jamb and the notch you see is where the lock mechanism is on the patio door which actually holds it in place snugly. You could have a piece go down to the bottom of door jamb and frame the wood to hold a store bought doggy or cat door. love the doggy doors. Both of them and now I need to get my brother to make it for me. As you mentioned, “opening and closing the door every hour”. I do the same thing. Don’t have cats but two small dogs that drive me nuts wanting in and out all day. Yours is the only one I could find on DIY so thank you very much Renee for posting this. Your hubby did a wonderful job. Gail.